Visit the trail conditions page for the latest information, especially helpful are the contributions tagged equestrian issue. Obstacles blocking the trail are common. Perhaps it is a fallen tree, a large boulder, a scree field, a questionable snow crossing, a difficult ford, a washout, or a part of the trail closed because of fire. All of these and more are possible during a long ride on the PCT. The PCT is frequently impassable to horses. Getting safely past obstacles may require detours of a few minutes, a few hours or even days. The goal of the PCTA is to maintain the trail in a shape that is passable to equestrians – the reality is that it is not always possible. Be prepared to saw logs, but know that some will be too big or too dangerous for you to remove. Sometimes they’re too impractical, or impossible, to go around, too low to go under and too big to go over with a horse. You might have to turn around. Be prepared for that by bringing extra food and maps that show alternate paths. If you are pressured and trying to stay on schedule you might be tempted to take risks and hope for the best. You could end your journey by injuring or killing your horse or yourself. Don’t rely on being lucky to get you safely past a risky situation. Calculated risks sometimes fail. You may lose the trail if you try to cross deep snow – and you don’t know what is under it. It is always risky to try to ride through deep snow. Trail crews don’t clear down trees and repair trail damage until most of the snow is melted. It might be necessary (and smart) to bypass some areas if they are still considered impassable or unsafe for horses. You can always return to ride those sections when conditions are better. Recognize that the snow-free window may be too short for a “pure”, “no flips, no skips” thru-ride. North of Southern California the trail is snowbound until well into summer. You’ll have to wait until the snow melts. That leaves about 2,000 miles of trail that is passable from sometimes in July through late September. That’s too many miles in too short a time for most people to complete. Keep in mind that trees can, and do, fall at any time of year – expect it. Sometimes you’ll ride around a corner on a narrow and dangerous section and come upon an obstacle. Stop. Take the time to carefully consider your options. Don’t be influenced by the extra time it might require to take the safer option. Give yourself permission to turn around if you can’t get past safely. Know in advance how to turn a horse around on a narrow trail. It is at places like these where trying to turn around with a pack animal, can be complicated and risky. If the obstacle is a down tree, tie your horse and consider taking the time to cut it. If you start from the southern border in April or early May, you should have already made arrangements to be trailered around the dangerous snow conditions of the San Jacinto/Fuller Ridge part of Section B. If you reach Section D in late May or in June, plan on taking a bypass route to get around the snow of Mt. Baden Powell. North of there the trail is usually pretty much snow-free and passable to stock until you reach Horseshoe Meadows. North of there, most years, snow conditions crossing Forester Pass and other high passes will make riding through the Sierra Nevada very risky until at least early July. Also, north of Horseshoe Meadows, you will be entering Sequoia, Kings Canyon, and Yosemite National Parks. Bear canisters (or bear resistant panniers if you have a pack animal) are required. 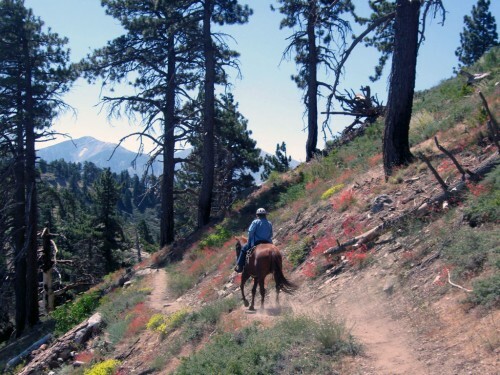 Many other places on the PCT have problem spots for horseback riders. One notorious section is in Goat Rocks Wilderness. Consider contacting local land managers. They often have helpful advice on where to camp, graze and trail conditions.